Srinagar: Jammu and Kashmir Liberation Front chairperson Muhammad Yasin Malik on Monday drove to Hyderpora residence of octogenarian Hurriyat patriarch Syed Ali Geelani and held an hour-long meeting with him. Geelani, Malik and Hurriyat Conference (M) chairperson Mirwaiz Umar Farooq are part of Joint Resistance Leadership that spearheaded the 2016 summer uprising after the killing of top Hizb commander Burhan Wani. However, Mirwaiz, sources said, was not part of today’s meeting. 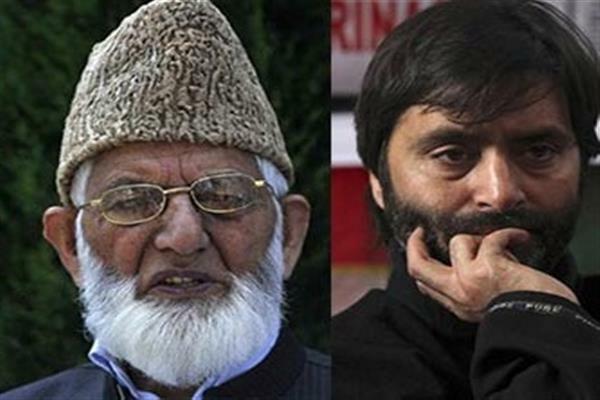 Sources said that the Malik reached the residence of Geelani Monday morning and held a meeting with with. However, the details of the meeting were not known immediately. The meeting comes amid heightened tensions between India and Pakistan n the aftermath of Pulwama militant attack that left 49 paramilitary CRPF personnel dead and several others injured. On Sunday the government also withdrew the security of four Hurriyat leaders including Mirwaiz Umar Farooq, Shabir Shah, Professor Abdul Gani Bhat and Bilal Gani Lone.